Hosai Baido (1848 - 1920) as Kunisada III, Actors in a Kabuki Drama, 1890. Oban Triptych. 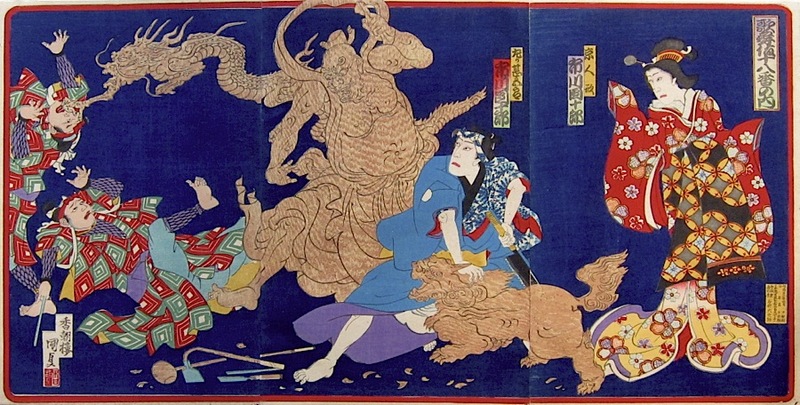 A fantastic triptych full of drama, Meiji colour and action. This wonderful piece is of a kabuki play in which various supernatural statues, (a demon, a Chinese lion and a serpent) come to life. The actor on the far left is Ichikawa Danjuro IX. The drawing, and the handling of the statues are modelled on an 1863 print by Yoshiiku: Chapter 13 from the series Contemporary Comparison of the story of Prince Genji. In this print, the wood carver’s statues magically come to life to defend the artisan from attack by ruffians, pictured here on the left hand sheet. The sculptor is seen in the centre sheet holding a traditional Japanese saw as his creations leap to his defence. The figure on the right - an onnagata actor - is presumably a sorceress, responsible for the magical animation. The sculptor’s tools lie scattered in the foreground. There was a great deal of superstition surrounding the life sized and alarming realistic Japanese puppets called Bunraku. Puppet theatre predates kabuki theatre and informed much of the style, dramas and conventions that kabuki adopted and made its own. Not only does puppet theatre (bunraku) have an important place in Japanese culture but so do its close relatives: the extraordinary lifelike tableaux of life size dolls, called Iki-Ningyo, that were the craze in Edo Japan in the nineteenth century. These staggeringly naturalistic creations are pictured in woodblock prints by Kuniyoshi and other ukiyo artists, although in most cases there is little way of telling that the figures acting out popular melodramas are in fact not human. A fine print in perfect condition, fine colour and impression, mica in the blue background.